Breg is the leader in motorized cold therapy. Since 1991, we’ve helped patients manage post-op pain with cold therapy systems that are easy to use and reliable. Polar Care Cube cold therapy unit continues our cold therapy innovation and raises patient care to the third power. The Polar Care Cube is a reliable, easy to use cold therapy device from Breg. How does cold therapy work? Cold therapy is effective for a variety of reasons. First, it decreases fluid build up (swelling) in the injured body part. Second, it slows the release of chemicals that cause pain and inflammation. Third, cold decreases pain by reducing the ability of the nerve endings to conduct impulses. And lastly, it aids in pain relief by limiting the muscle’s ability to maintain contraction, thus reducing muscle spasm. Because of these benefits, cold therapy is generally prescribed throughout the duration of your rehabilitation. Why is motorized cold therapy better than ice or gel packs? Ice and gel packs administer intense cold over a small application area for a short period of time, requiring frequent trips to the freezer. Cold therapy systems, such as the Breg Polar Care Cube, deliver a motorized flow of cold therapy through circulation pads that are specifically designed for different body parts and applications. And, they deliver cold within a comfortable temperature range that allows for longer-term application according to your physician’s prescribed treatment protocol. Depending on the type of unit you are provided, the system will typically maintain its cold for 6-11 hours per ice change. 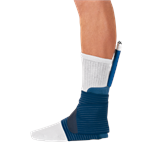 Compression is another widely recognized method for relieving uncomfortable swelling associated with surgery. Polar Care Cube cold therapy systems help to alleviate this condition by comfortably compressing the injury site, thus aiding the healing process. How does a cold therapy system work? The Polar Care Cube cold therapy systems provide cold therapy through a patented method of temperature regulation exclusive to BREG. By utilizing ice and water that is circulated from an insulated fluid reservoir to a pad that is applied to your postoperative site, the system provides cold therapy for an extended period of time between ice changes. Is a cold therapy system right for me? Like most medical devices, all cold therapysystems require a doctor’s prescription. Cold therapy is not for everyone and can result in serious skin injury if misused. Talk to your doctor about your medical history and potential risks associated with cold therapy. Your doctor will determine if a the Polar Care Cube cold therapy system is right for you. How will I pay for my the Breg Polar Care Cube cold therapy unit? Most insurance companies do not cover the cost of these types of medical devices, even if you have a scheduled surgery. However, some insurance companies will reimburse you. Typically, this involves filling out a form and sending a copy of the receipt and prescription to your insurance company. Using Breg Polar Care Cube cold therapy cold therapy is an important step in your post-operative recovery. Most users are happy with their decision to use cold therapy despite the cost, and they often recommend it to others.